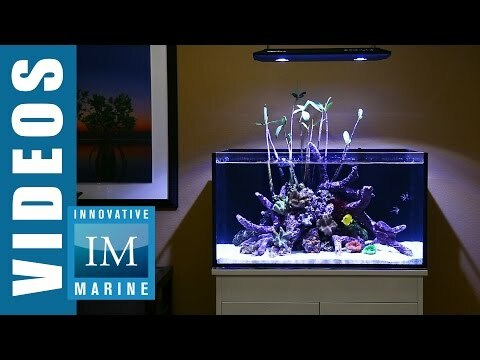 Does this tank have the filter wall. I just had to cancel an eBay order due to the wrong pictures being shown for an Innovative marine tank. Yes, this tank comes with All-In-One filtration section in the back. The pictures all show the tank with the stand..is the stand included? Stand is sold separately as per description. Does it come with a return pump? Yes, return pump is included with this kit. If your're thinking about buying this aquarium. Just buy it ! You wont regret it ! Aesthetically this aquarium is absolutely breathtaking. I love everything about it. Design-wise it is well built, having the filtration built in makes everything so much easier and last but most certainly not least the high clarity low iron glass is insanely clear, it almost feels like I am looking through a window into an ocean as weird as that may sound. They mentioned that it would take about two days for it to deliver and instead it came the next day after ordering. It is worth mentioning that I am located in Michigan which is "right next door" to Ilinois but man was I excited!